September 07, 2011 in "pattern"
Introducing my new cardigan design. 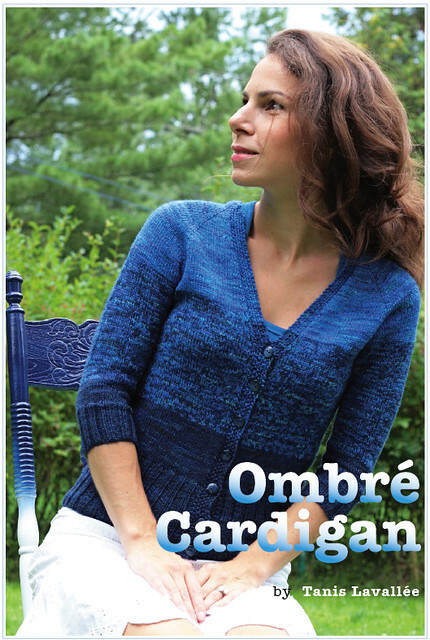 The Ombré cardigan was inspired by my desire to knit a fun garment using two strands of Pink Label Lace Weight yarn held together. The resulting fabric is squishy yet light, the perfect little cardigan! This is a fitted cardigan with a v-neck and 3/4 length sleeves. It is well suited to endless colour combinations, but of course, I chose my favorite shades of blue for my version (cobalt and midnight). I love how it adds a pop of colour to any outfit. I'll be bringing hard copies of the pattern along with plenty of lace weight yarn to the KW Knitter's fair with me this weekend. Tomorrow I'll be debuting another new pattern, it's going to be a busy week! **NOTE: Yarn is held double throughout entire sweater. Needles: 4mm, 32” circular needle. Sweater is knit in one piece from the top down. 4mm, dpn’s. Or size needed to obtain gauge. Additional Tools and Materials: Stitch markers, waste yarn or stitch holders, tapestry needle, 7 buttons, (more or less depending on the length of your sweater). Gauge: 23 sts and 32 rows in 4” in stockinette stitch with yarn held double. All the pattern details can be found here on my website.